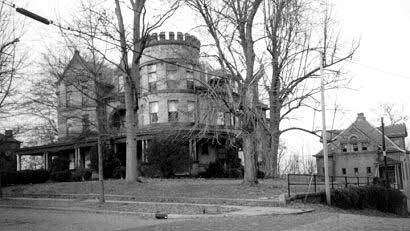 (NOTE: This house burned down in 2006) The house at the crest of Garland Hill had many surprising harmonic elements: Moorish arch, French dormers and crenelated medieval tower. This architecture marks the transition from Victorian to Edwardian styles. The house was built in 1899 by architect J.M.B Lewis for Ambrose H. Burroughs, a lawyer whose fortune is attributed to the Bonsack cigarette machine account. Burroughs lived here only a few years. The house stood vacant for many years before Judge Don P. Halsey bought it in 1926 and had it converted into apartments. The name, 'Halsey Terrace', graced the front of the house. Note the Palladian window on the carriage house which remains on the right.